I know we have all had days where it seems like EVERYTHING just goes wrong and all you want to do is cuddle up in bed and cry and every single thing someone says or does seems to bother you. I don't mean "the time of the month" kind of days. I mean when you're in a bad mood for no reason kind of days. I don't know why but monday was "that day" for me. Everything that my husband would say would either irritate me or hurt me. It's not like he was insulting me! He simply asked me if I would make him a smoothie ?! Yes a smoothie people! I was busy making the kids lunch and didn't feel like making a smoothie so everything escalated from there and then out of the blue he said "have you been doing your devotionals?" um no! Well his question made me angry at the time but later on I reflected and realized what he was trying to say. So after apologizing for my craziness (poor man!) I decided to get up and read my devotional and pray and make the next day a better day and seriously there is nothing better than starting the day off spending time with God! It's so easy to stress out and not take time to enjoy the small things in life. Which brings me to the picture of the sandals. 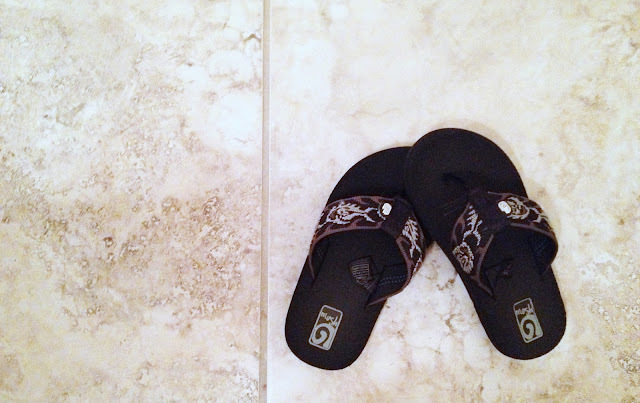 Those are my sons sandals and I don't know why but it bothers me so much to find shoes all over the house. I like for things to be right where they are supposed to be, where I can find them. I usually scream "Josh come get these shoes and put them where they go!" But this week as I was going into the bathroom and I saw those two little sandals, I stopped and... Instead of screaming I simply thanked God for having little sandals to pick up. Instead of complaining about washing dishes (which is the thing I hate to do the most) I thanked God for having plates and cups to wash because that meant there was food to eat, that God provided. Instead of stressing out about finding toys everywhere and having to pick them up I thanked God for my two kids and for being able to stay home with them. Sometimes I feel that even though I get to stay home with my kids I don't enjoy them like I should! I let stress over having to clean a home, wash dishes, do laundry, cook, work on designs & everything else get to me. I pray that God changes that in me. That I may enjoy my kids more. That I can find joy in every single thing I do! To stop and enjoy the little things in life. May you have a stress free weekend and may you focus on enjoying the little things you normally don't! what a nice way to put it Cindy. It makes me want to call the school and tell each of my kiddos how greatful I am for them. Oh here I go with waterworks! lol. Thanks for this friend, I needed a reminder. Life goes too quickly, I truly need to enjoy all the little moments in this beautiful journey of life. Girl, you were preaching straight to me here! That was a really encouraging post. I have been so convicted of this lately and am having a really hard time getting into a quiet time with God habit. I find a million things to distract me and always say I'll do it later. And then of course I just forget completely. I've been thinking I need to find an accountability partner (my hubby would do it, but I have a feeling half the time it would just irritate me and make me feel like he's on my case--there's that attitude and exactly why I need to do this) to check in with every day.